Following his adventures in the Scottish Highlands, James Bond is back at Eton, where he has joined the risk-taking Danger Society. Summer vacation is on the horizon, and James is looking forward to the school trip to the beautiful Italian island of Sardinia and the opportunity to spend some time with his reclusive cousin, Victor. But all is not as it appears. James soon discovers that the seemingly peaceful island harbors some strange secrets. Before long, Victor's house has been ransacked and important pieces of artwork have been stolen. James learns that the Millennaria, a ruthless Roman society long thought to be extinguished, is still active. He suspects the impetuous millionaire Count Ugo Carnifex may be behind it. But one of his teachers has been acting strangely as well. As a young girl's life hangs in the balance, it's up to James to uncover an intricate conspiracy that will take him head-to-head with enemies more ruthless than he could have ever imagined. 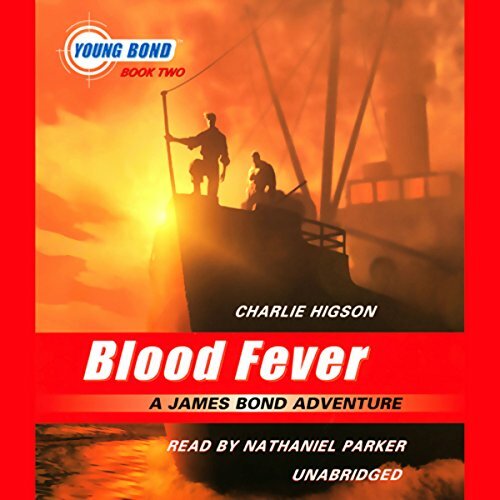 Young Bond book two Blood Fever is better than Silverfin in my opinion. This is the first book in this series that the reader and/or listeners get to experience Bond travel the world well at least out of England. Bond fans get to meet more of 007s family. Also, Higson creates the danger society for James to have some structure. Just like in Silverfin The narrator is awesome. Enjoy this novel its another page turner. The name will be Bond, James Bond! Charlie Higson, take on the mantle of the late, great Ian Fleming's immotal spy James Bond, but with a twist, he tells the story of the futere 007 from his youth! In this, the second volume of a five part series, Young Bond face art thieves, murderous scoundrals, pirates and double dealings, from the hallowed halls of Eton, to the sun and blood soaked Sardinia! Very well written by Charlie Higson, he brilliantly captures the spirit of James Bond as a youth. Exciting with never a dull moment this is a highly recommended, must have adventure for both fans of James Bond and grand adventure! What would have made Blood Fever better? I don't know...my Grandson lost interest in the middle of chapter 2. Would you recommend Blood Fever to your friends? Why or why not? To try, sure. I like the story, but I'm not the audience my Grandson is. I have no idea...Nathaniel did a great job with Stormbreaker, but this series seems to be done differently...more agitating. My Grandson couldn't put this into words. I liked the story line, but it wasn't for me. I'm continuing to try books until I find a series my Grandson takes to like he did Stormbreaker. Love Bond; always have, always will. Bond never diaappoints. Always keeps you on the edge of your seat. Cant wait to read the next book! Great book, excellant narrator. The book could be a little more details with the characters and who they are.